Photo: Philip Curry from the bridge 2.5 miles upstream of the trailhead. Copyright Chris Bell. This is a gorgeous run on a pristine river whose entire reach is within a National Park. Please respect other users and the natural environment. Minimize your impact in all ways possible. The following description is courtesy of The Asheville Area Boating Beta Page (boatingbeta.com). To view it in a new window, click here. V 1200-2400 cfsÂ Upper Big Creek is almost certainly running when the Oconaluftee is between 1,200 and 2,400 cfs;Â it is generally running when the Oconaluftee is as low 850 cfs.Â Once at the creek, confirm the level using the gauge painted on the river right piling of the bridge next to the picnic area near the confluence of Big Creek and the Big Pigeon;Â 1.5 feet is the minimum, 1.7 low optimal and 2.4 high optimal.Â It is unlikely Upper Big Creek has been paddled much above 3.0 feet -- it gets much harder as the level rises. It is often true that when the TVA's Little Pigeon at Sevierville (not the same as the USGS's Little Pigeon at Sevierville) gauge is between 1,500 and 3,000 cfs, Big Creek is running.Â Despite being located on the next watershed East, the USGS Cataloochee gauge isn't a very good predictor of Big Creek flows. The Oconaluftee and TVA Little Pigeon at Sevierville flows are both available on theÂ TVA Streamflows site and from the TVA by telephone:Â 800-238-2264. Scenery: Very scenic despite occasional glimpses of horseback riders and hikers on the old railroad grade following the creek.Â This run is entirely within Great Smoky Mountains National Park. 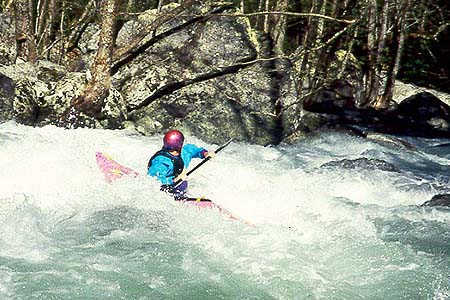 Other sections: Upper Big Creek is a challenging class V creek run, while Lower Big Creek provides an excellent introduction to creeking for boaters with strong class IV skills. Put-in: The wooden footbridge at Walnut Bottom, or as far upstream as you're willing to hike . . . (see shuttle description below!). I-40 West toÂ the first TN exit (Exit 451, Waterville).Â Turn left at the bottom of the ramp, pass under I-40, follow the road over the bridge, turn left and head up the Big Pigeon.Â The road will turn to follow Big Creek at its confluence with the Big Pigeon, crossing Big Creek twice.Â Stop at the second bridge and check the gauge.Â Then continue on to the road's end at the parking lot below the Big Creek Campground.Â The gravel road you'll cross just before entering the park is the scenic route to the Cataloochee Campground. Shuttle: 1-2 hour hike.Â Park, pick up your boat and start hiking up the trail to Walnut Bottoms.Â The trail begins at the parking lot just downstream of the Big Creek NPS campground.Â Huff your boat as far upstream as you like.Â Big Creek is runnable at least as high up as Walnut Bottoms (5.4 river miles upstream), but most run out of gas a half mile or so upstream of the firstÂ bridge over the creek, a 2.5-3 mile hike (and run).Â Hiking the half-mile or so above the bridge yields two back-to-back miles falling 292 and 321 feet, respectively, with a 192 foot final mile to the take out.Â This is all runnable and extremely continuous gradient, with the single biggest vertical drop being the ten feet or so into Midnight Hole.Â The additional two plus miles gained by hiking all the way to Walnut Bottom are extremely nice and would seem steep almost anywhere else, but are seldom run due to the effort involved.Â An alternate route into Walnut Bottom is over the pass from Cosby. Other access points: Many possible from the railroad grade following the creek, but all are accessible only by foot. Camping: If it is open and you can snag a spot, the Big Creek campground would be a wonderful place to camp.Â However, there are only twelve campsites and they're very nice, so they're in high demand.Â Further,Â the campground is seldom open when Big Creek is running.Â Another option is the campground at Cataloochee, which can be reached from both the road over the low-water bridge at the put-in and a right turn off the road from the take-out to the Big Creek Campground.Â The Cataloochee campground is a little larger (twenty-seven sites), so the odds of getting a site are a little better.Â Also fairly close is the Cosby campground, which is much larger than either the Big Creek or Cataloochee campgrounds (175 sites).Â All three campgrounds are open from mid-March to the beginning of November;Â the Big Creek and Cataloochee campgrounds are $12 per site per night, and the Cosby campground is $14.Â For more information visit the NPS's Great Smoky Mountains Camping Page. Combining Upper and Lower Big Creek yields a 7.3 mile run falling at an average of 216 fpm. Hazards include the extremely continuous gradient and frequent fallen trees.Â This is full on creeking;Â a safe run requires frequent scouting and great alertness to the possibility of downed limbs just under the water's surface and jammed in undercuts. Midnight Hole is the vertical drop clearly visible from the trail on the hike in.Â It is an extremely popular swimming hole in the summer.Â Just upstream of Midnight Hole, at a point the trail comes very close to the creek, is Monster.Â On one recent run an extremely accomplished and well-known local paddler pitoned and pinned head underwater in Monster.Â Through good fortune another paddler in his party -- unaware of the pin -- ran the drop and knocked the pinned boat and paddler loose.Â The next boater down ran the drop unaware of the carnage below, pinned and swam.Â His broken boat stayed pinned for two days.Â Run the left line at Monster or walk it! This is by no means a complete list of Upper Big Creek's hazards;Â such a list would be impossible to compile as it would constantly change as rocks shifted (the apparent cause of the recent problems on what used to be a popular line through Monster) and trees jammed. This is a gorgeous run on a pristine river whose entire reach is within a National Park.Â Please respect other users and the natural environment.Â Minimize your impact in all ways possible. Copyright Â© 2000-2002 [Chris Bell (email), Asheville, NC]. It is often true that when the TVA's Little Pigeon at Sevierville (not the same as the USGS's Little Pigeon at Sevierville) gauge is between 1,500 and 3,000 cfs, Big Creek is likely to be running. The main way to tell if BC is running is to pay attention to the rain. Pin Oak Gap is an excellent rain gauge for Big Creek. It is only 2 miles from the south side of the watershed, and usually if Pin Oak Gap gets rain, Big Creek gets it too. Look for an inch in the past 24 hours during times of good saturation, and 1.5 inches in drier times. Cataloochee Creek is another indicator. If Cataloochee gets over 350-400 cfs, assuming even rainfall distribution, BC should be running. Usually though, there are usually acute local variations in rainfall totals between these two watersheds. During wet times, BC is the most frequently running class 4-5 creek run of its character. It runs more often than the West Prong, Tremont, or Middle Prong/Ramsey's. It has been known to run for weeks during rainy summer periods, providing a sweet creeking fix nowhere else to be found. 2.1-2.3 - You must be desparate. 2.3-2.5 - Some people might call you desparate but you can still get your boof on. 3.0-3.3 - medium high, with the 3.0 range being the perfect level, and the 3.3 range changing the run from class 4+ to intense and scary class 5. 3.3-3.8 - This is plain high. Many do it at 3.5 once and say that was enough. Fun, but enough. If you do it at 4 feet, once might be all you get from Big Creek ever again. Anything above 3.5 is officially too high for all but a few junkies.